People put bills and coins and coins in a church collection plate. Five percent of U.S. adults tithed gave 10% of their income to the church in 2007. 2: Many beliefs, many paths to heaven? 4: Where is Christ in Christmas? CHICAGO — While millions may lose their homes during the worst housing slump since the Great Depression, some devout Christians among them will do so in part because they will not give up tithing — a voluntary contribution to their churches amounting to 10% of their gross income. "I've had home owners who face foreclosure sitting in front of me saying, 'I'll do anything, anything to keep my home," said Ozell Brooklin, director of Acorn Housing in Atlanta, a nonprofit which offers foreclosure counseling. "But after we've gone through their monthly expenses and the only thing left to cut is their tithe, they say 'I guess this home is not for me' and they walk away," he said. IDEA CLUB: Is moral hazard looming in bailout? The idea of a tithe — from an Old English word meaning "a tenth" — derives from an Old Testament reference to a tax the Israelites paid from the produce of the land to support their priests, fund religious festivals and help the poor. The Barna Group, a California-based research firm, estimated in an April 2008 study that 5% of all American adults tithed in 2007. Evangelicals had the highest percentage (24%), and the study estimated that 12% of conservatives and 10% of registered Republicans tithed. Researcher George Barna said evangelical Christians are far more likely to tithe than other denominations. "As born-again Christians they believe they have been saved and that tithing is a way to express their gratitude to God," Barna said in an interview. "Evangelicals are interested in the economy, but they don't believe governments have been ordained by God to provide all the solutions." Dr. Roger Oldham, a member of the executive committee of the 16-million strong Southern Baptist Convention, the second- largest Christian grouping in the United States after the Roman Catholic Church, said tithing was a compelling personal commitment. "It's a simple fact that here, as in any Christian culture, you will find some people for whom obedience to God comes second to none," he said. "For those people, a contract with God is worth more than their home." While nonprofits around the country say tithing is an issue in some foreclosure cases, little data exist on the phenomenon because many counselors are trained not to bring up the sensitive issue with struggling home owners. "You can suggest that maybe they can pay their tithe in kind, through volunteer work," said Bathsheba Wyatt-Draper, a counselor at nonprofit lender NHS Chicago. "But if they react badly, you have to let it go. Period." Barna said evangelicals tend to adhere to the Gospel according to Matthew, that teaches "when you do good works, do them in private." 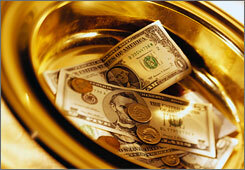 "In the case of tithing, evangelicals feel that 'this is something between me and God. I am not doing this to put myself on a pedestal and talk about the wonderful sacrifices I have made.' The whole idea is not to draw attention to yourself." Milton Sharp, a home ownership specialist at NeighborWorks, an umbrella group of 230 nonprofits, said for many borrowers tithing is "mandatory and not a discretionary item that can be cut." Debt counselors said the borrowers most likely to face a dilemma over tithing are people in lower income brackets. "Often it's the folks who can least afford it who tithe," said Regina Grant of the Atlanta Cooperative Development Corp.
Linda Ingram of St Louis, Missouri-based nonprofit Beyond Housing said, "Tithing is a very sensitive subject and you have to be careful as to how you approach it." Ingram said one of her clients was a 68-year-old woman who obtained a $62,000 mortgage on behalf of her daughter. When her daughter stopped paying the mortgage this spring, the woman was stuck with payments since her name was on the loan contract. To stay current on the $500 monthly mortgage, she was faced with giving up a tithe to her local evangelical church of around $200 a month. Instead, she let the property go into foreclosure. "I made an agreement with the Lord 30 years ago and I have tithed ever since," said the woman, who declined to give her name in an interview. "Nothing could persuade me to give that up. My relationship with God comes first." Asked why she would not be named, the woman said, "I don't want people to think I'm crazy." Home owners in similar straits are just as reluctant to talk. John Tiemstra, a professor at Calvin College, a Christian college in Michigan, said that was no surprise. "There is a very prevalent attitude among conservative Christians that their personal finances are an intensely private matter," he said. "This gets in the way of what the church could do to help them when they are in trouble." READERS: How much do you give to religious groups? Will that change due to the economy? Polícia paulista aposenta o "três-oitão"